An alliance of three main groups, the United Left Alliance eventually wants to become a full political party but there are differences within the group about how quickly that should happen. 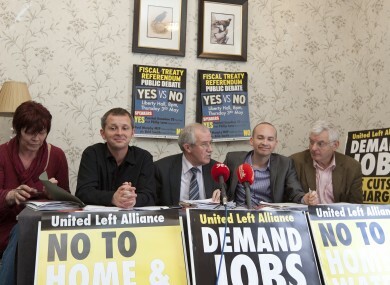 (L to R) Joan Collins, Richard Boyd Barrett, Seamus Healy, Paul Murphy and Joe Higgins at a recent ULA press conference. WITH AUSTERITY THE dominant economic idea across Europe, there has been a sharp rise in support for parties on the left particularly in countries where the right has dominated in recent years. In the aftermath of the financial crisis, the left’s rise has manifested itself in electoral success in France and huge electoral gains, if not victory, in troubled Greece. In Ireland, the rise of the left has been less obvious but nonetheless significant when you consider that at the last election, five truly left wing TDs were returned along with a smattering of independents who are at various points across the political spectrum. Prior to last year’s election the Socialist Party, People Before Profit (PBP) and the Workers and Unemployed Action Group (WUAG) came together under the banner of the United Left Alliance (ULA) with the intention of addressing a “crisis of representation”, as the veteran socialist Joe Higgins put it. “We have a unique and historic opportunity to make a significant step forward in the construction of a new movement that will represent working class people from unemployed, from public sector, from private sector, from pensioners,” he told a meeting of the ULA in February 2011. Broadly, the movement is against household and water taxes, believes Ireland’s bank debt should be repudiated and wants higher taxes on the thei higher paid. Over a year on from the election, and buoyed by the household charge boycott campaign, there is an appetite within the ULA to form a mass political movement of the left, a political party. But there is a difference of opinion as to just how quickly it should happen among members of the alliance itself. While the Socialist Party are keen to retain their status as a political party under the banner of the ULA, there are some in PBP who feel that the matter is more urgent, that the sooner there is a proper, united political party of the left, the sooner it can really compete at an electoral level in the way Syriza has in Greece. “It’s imperative that the left unites in Ireland given the current pressures from the Troika,” People Before Profit TD Joan Collins told TheJournal.ie this week. It is difficult with three different organisations but we also have a broader group of independents that are not aligned to any party who are undoubtedly working in the ULA, trying to pull together. It should be sooner rather than later and we should come out publicly and we should register ULA as a political party. That’s my strong feeling. It’s a feeling which is noticeably different to that of the Socialist Party MEP Paul Murphy: “It’s not something that’s happening overnight,” he told TheJournal.ie recently, appearing reluctant to give up the idea of the Socialist Party in Ireland no longer existing, being subsumed into the ULA. “It’s certainly the Socialist Party’s vision that we would want to be part of a broader left party. We wouldn’t give up our existence but would be part of something broad, a broader party, like a political party,” he said. The steps involved in making this happen are incremental ones in the eyes of Murphy. They involve opening up the alliance to membership, as it has already done, whereby anyone can now sign up to be a member of the ULA as opposed to having to become a member of one of its constituent groups. There is also now a delegate council of the ULA involving different branches of the United Left Alliance from across the country meeting on a regular basis and acting in an advisory role to the party’s representatives on councils and in the Dáil. Inevitably there will be comparisons made with a movement like Syriza in Greece, a coalition of the radical left that finished second in the country’s recent general election but opted to go into opposition rather than to form a coalition with the pro-bailout New Democracy and PASOK. The decision to go into opposition was largely driven by a reluctance to honour the terms of Greece’s current bailout programme under any circumstances. Syriza wanted to renegotiate the deal unlike the two main establishment parties – New Democracy and Pasok – who broadly plan only to tinker with the deal. It’s not hard to draw parallels in Ireland where Fianna Fáil and Fine Gael are both supportive of the bailout programme. A key founding principle of the ULA is that it will not enter into a coalition with the “capitalist parties” as Murphy refers to them. That could block off a route for Sinn Féin entering the ULA if it were ever to consider doing so. “I think Sinn Féin will have big questions to answer to itself and its membership whenever there is a question of forming a government,” Murphy said. In any case, the likelihood of a party with nearly three times the representation of the ULA in the Dáil - as Sinn Féin has – wanting to join with it is highly unlikely. So too is the likelihood of the Labour Party joining forces with the ULA given it is in coalition with one of the aforementioned “capitalist parties”. But more pressing than all of those hypotheticals is the current economic climate and the reluctance of many in this country to put up with the current austerity policies of the government, enforced by the Troika agreement. “I think we have a situation in Greece when Syriza stood in a really important election. That situation could develop in Ireland,” Collins said and cited the recent campaign against the household charge as something that was co-ordinated across the country. Murphy agreed: “It’s (household charge boycott) the biggest civil disobedience movement in the history of the State,” but added that the ULA “isn’t about people giving up their politics”. It will become more imperative that we do (merge). It would be shame in the upcoming local elections that we would not be running as ULA because that would be a real progressive movement. History tells us that movements on the left often become splintered as was the case in Ireland in 1992 when the Workers Party split to form Democratic Left which itself later merged with the modern day Labour Party, itself still a centre-left party but far away from the policies of the ULA. For those who feel that a merging of organisations within the ULA is urgent, such as People Before Profit, there is a catch-22: If they walk away from the Socialist Party and the ULA because they are dragging their heels, the movement of the left in Ireland becomes splintered once more. “It would be irresponsible of organised groups not to move forward in that direction,” Collins said, citing the confusion that could be created by the appearance of Socialist Party/United Left Alliance or People Before Profit/United Left Alliance on ballot papers. In the last election, the ULA failed to get itself added to the names of its constituent parties on the ballot paper because of timing. It’s almost certain the ULA will appear in some shape or form on the next election ballot papers but whether or not this will be as it stands in its current form as an alliance or as a fully-fledged political party is not yet clear. For some within the movement that is a more urgent matter than for others. Email “'It's imperative the left unites': How the ULA wants to become a political party ”. Feedback on “'It's imperative the left unites': How the ULA wants to become a political party ”.